On the fourth day of Christmas, Australian Bush Flower Essences gave to me… Wedding Bush (Ricinocarpus pinifolius). 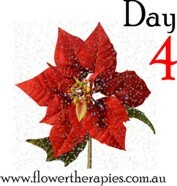 Hopefully you have started on your way to implementing true changes this Christmas, using the Australian Bush Flower Essences of the past three days. If you haven’t, then I know that today’s Essence is probably the best place for you to start, as it adds a necessary ingredient that is required for any change to be long-lasting: commitment. Wedding Bush Essence, as the name might suggest, helps you commit to the situations you desire, ensuring you maintain the new patterns and create the necessary behaviours to maintain your momentum. Despite the fact that we often dislike or even despise our current behaviours, we can still find ourselves falling prey to old habits when uncomfortable situations arise. Wedding Bush Essence can help you to ensure that you think before you proceed down that old familiar path, choosing instead to consciously act in a way that supports your new desires. Remaining true to yourself: Often during the hustle and bustle of family festivities it can be easy to forget the promises you have made to yourself. Whether that be committing to eating and drinking moderate quantities of food and drink, or being true to your opinions without being ‘steam-rolled’ by others who hold stronger views, it can often be hard remaining ‘ourselves’ outside of our normal daily patterns. Wedding Bush Essence can be useful to help you commit to being true to your own needs, no matter how much pressure friends or relatives put on you. So you can get through the festive season knowing you had the willpower to be yourself – no matter what. Sticking to your own agenda: Wedding Bush Essence can help you to commit to your own plans so that you can actually do what you desire this festive season, rather than the usual barrage of events that you attend in order to please everyone else. Often we go along with other people’s expectations in order to ‘keep the peace’ but this type of behaviour comes at a price: disillusionment, decreased self-esteem and even levels of resentment or anger. Wedding Bush Essence can help you to remember that your concern first and foremost needs to be for yourself, and what doesn’t make you happy, isn’t serving you. Committing to working on your relationships: Since Christmas is supposed to be a time of goodwill, one of the best ways to work on creating more joy is to commit to working on your relationships with the people in your life. Whether they be relationships with a partner, mother, father, siblings or friends, all relationships require work, and require us to give of ourselves. Wedding Bush Essence can help you to commit to putting more of yourself into your relationships in order to develop deeper connections, but at the same time ensuring that these relationships don’t come at the expense of the most important relationship of all: your relationship with yourself. Developing a regular health and exercise regime: Most of us do it at some point over the Christmas season, so you needn’t feel ashamed of the fact that all the festive fare can tempt you to overdo it sometimes. And unfortunately the guilt and even shame that often appears as an after-effect can again be highly detrimental to our level of self-esteem. Wedding Bush Essence can help you to develop and commit to a health and exercise program over the festive season and beyond to ensure that you are able to burn-off those extra not-so-festive calories and avoid the guilt in January. Another helpful benefit Wedding Bush Essence can have is to ensure you stick to your own routine and maintain it: no matter how much cajoling your loved ones put you through during festivities! The above ideas are just some of the benefits that Wedding Bush Essence can add to your festive season. You can use this Essence to help you commit to whatever it is you want to have in your life, or to implement whatever changes you wish to make. So be creative and add this Essence to whatever new program, regime or commitments you are about to make, and watch the magical changes that can happen in your life this Christmas! Remember to check back tomorrow as we continue forward onto the fifth day of Christmas Essences (subscribing here is the easiest way to enure you don’t miss out on any of the Essences! ).